Organ failure is a hallmark of sepsis. As the body is overwhelmed, its organs begin to shut down, causing even more problems. The kidneys are often among the first to be affected. According to the National Kidney Foundation, one of the major causes of acute kidney injury (also called AKI) is sepsis and some studies have found that between 32% and 48% of acute kidney injury cases were caused by sepsis. Most people are born with two kidneys. It is possible to live with one kidney and many people do. These bean-shaped organs are each about the size of your fist and are found in your lower back, one on each side of the spine. 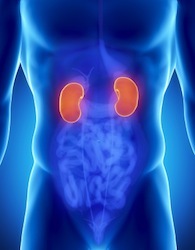 The kidneys’ role is to filter the blood for waste products that come from what you eat and drink. The nutrients are kept and the waste is eliminated through your urine. After the kidney has made the urine, it flows down to the bladder where it is held until you empty it by urinating. Another term for kidney function is renal function – the two terms are used interchangeably. There are two ways the kidneys could be affected by sepsis. The first is if the infection that caused the sepsis begins in the kidney, through a kidney infection or a bladder infection that has spread to the kidney. The second is if the cascade of events from sepsis causes the kidney damage. In sepsis and septic shock, your blood pressure drops dangerously low, affecting how the blood flows through your body. Because the blood can’t flow as quickly as it should, it can’t deliver the nutrients needed by the body’s tissues and organs. At the same time, the blood begins to clot within the blood vessels (called disseminated intravascular coagulation, or DIC), slowing down blood flow even more. The low blood pressure and DIC both contribute to the kidneys’ failure. Acute kidney failure symptoms Signs that your kidneys have stopped working effectively are caused by the buildup of fluid and toxins in the body. The most obvious sign is a decrease in the amount of urine that is put out, although this isn’t always the case. Some people do continue to produce urine, but lab tests will show that the urine is not normal. Someone with acute kidney injury usually also looks swollen, as the fluid accumulates in the body’s tissues. This swelling is called edema and can come on very quickly. Urine and blood tests tell doctors how well your kidneys are functioning, so many samples are taken during diagnosis and treatment. For example, the doctors test for creatinine, which is created when muscle begins to break down. A BUN test (blood urea nitrogen) tells you if a substance called urea is building up in the blood, an indicator that the kidneys are not filtering waste properly. When someone has sepsis or septic shock, the doctors work to treat the sepsis, the infection that caused the sepsis, and the damage that the sepsis has done, such as the kidney failure. If the kidneys are not working efficiently enough to filter toxins and allow urine to flow, an artificial way of filtering the kidneys, dialysis, will be needed. Dialysis is not a cure but it gives the doctors a way to clean the blood while they try to get everything else under control. There are two types of dialysis, hemodialysis and peritoneal dialysis. Peritoneal dialysis is generally used for people with chronic kidney failure, but it can be used for acute kidney failure where hemodialysis isn’t possible, in areas with limited resources. For example, peritoneal dialysis has been used in Africa, for patients who have malaria-associated acute kidney injury. With hemodialysis, a machine, called a hemodializer, is the artificial kidney. A catheter (tube) is inserted into the patient’s vein and the other end of the catheter leads into the hemodializer. When the process starts, blood flows a few ounces at a time, from the patient’s body to the machine, where it is filtered and then sent back through the catheter to the body. How often dialysis is needed and how long each procedure takes depends on how much kidney function still exists, how small or big the patient is, and how much toxins have accumulated in the blood since the previous treatment. Dialysis can be intermittent (for three or four hours every or every other day) or it can be continuous, but at a slower rate. In acute kidney failure, dialysis is usually considered a temporary measure as the doctors work to fix the problem that caused the kidneys to stop working effectively. 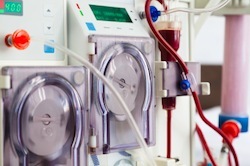 If the kidneys begin to work properly again, even if not at 100 percent, dialysis usually is no longer needed. Some people do need to continue receiving dialysis treatments if the kidney damage is too severe and is permanent. Since dialysis is not a cure, if they qualify, they may be candidates for a kidney transplant. Some sepsis survivors continue to have problems with their kidneys, despite recovering from the sepsis itself. If there is lasting kidney damage, patients will be monitored for their kidney function, which would mean having to have regular check-ups and blood tests.